Kitesurfing is the newest in extreme sports and is quickly captivating the sporting world’s attention. It’s incredible to watch good kitesurfers out there pulling amazing tricks that are impossible in any other sport, but what about becoming a kitesurfer? The combination of techniques in this sport is incredible, from surfing, snowboarding, wakeboarding, skateboarding, etc. However, learning how to kiteboard on your own could be frustrating…and dangerous. What typically took a year to learn on your own, can now be safely taught in just a few days in the Chicago area. Sign up here at Chicago Kitesurfing to get detailed information on professional instruction, from existing kitesurfers, and utilizing a very comprehensive program to insure everything the student will need to learn is completed. 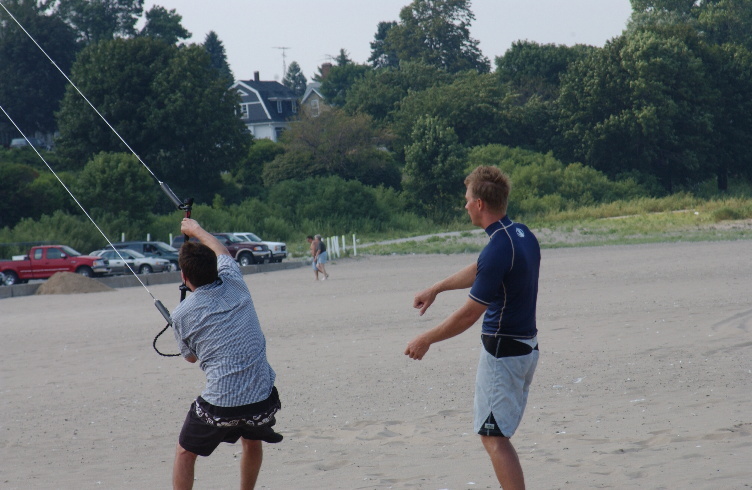 At Chicago Kitesurfing, our goal is to make kiteboarding a safe and rewarding sport that anyone can learn! Sign up today and we will contact you with more information. Yes! Training can be done in the winter. If you have a snowboard, we can show you how to kitesnowboard, or kitemountainboard if there’s no snow. The principles are the same and for the winter sessions, you don’t need to have your own equipment to get rides. So let us know – and we can get you started in the snow. (you need to provide your own snowboard, or skis). If you plan to take a land training course, bring your own helmet (bike helmet) and some pads like knee, shin and elbow. Remember, we want to do this safely. View our Introductory and Advanced Kiteboarding Training Class descriptions below for normal season training. This class was developed specifically for students interested in getting into kiteboarding properly. Kiteboarding is most quickly mastered by breaking down the learning process into two stages. Learning to fly the kite properly and safely before entering the water will dramatically improve your learning curve. This on-land class covers an overview of kitesurfing, the wind window, rider responsibility, equipment knowledge, rigging kites, tuning for conditions, kite safety, and of course…flying techniques. Introductory Lessons are taught in Level 1 winds to ensure safety. By completing this 3 hour course, the participant will be able to safely launch, control, and land true kitesurfing kite on land. Participants will learn the basics of kiteboarding, including flying trainer kites and a real kiteboarding kite through a small-to-large kite progression. Students will learn how to work as a team, watch out for other kitesurfers, and how to master kite control. Lessons start in the mornings, usually around 9-10AM, as the wind builds. We are at the mercy of the wind, so depending on weather, lessons might need to be rescheduled from time to time. Also, expect a 60-90 minute drive to the lesson location since inner-Chicago beaches are too crowded to do land-based trainings safely. Lessons start with the use of the Slingshot B-2 trainer. This is a small kite which generates minimal pull. It is safe to fly for the beginner and will help the beginner acquire basic kite skills and understand kite dynamics without any significant risk of injury. Once the B-2 trainer kite has been mastered, the lesson will progress to larger kites until the student is ready to enter the water to learn the water-skills. For the student to learn to ride, a private lesson is typically required due to the time needed to learn the basic kite skills. What you need for the class: Nothing but yourself and some shoes that can get sandy. Dress warm in the spring – bring a knit hat and gloves, the wind off the lake is very cold. It’s time to get wet! The Advanced Water Class is only for students who have already successfully completed the introductory class. Participants learn water right-of-way rules, riding techniques, kite water-relaunching, body dragging, board starts, how to ride, how to stop, and self-rescue. All water time is supervised with the aid of a jetski to prevent mishaps and allow the student to receive instruction while in the water. You will learn in comfort with someone there to assure you and oversee your actions, offering assistance the entire time. 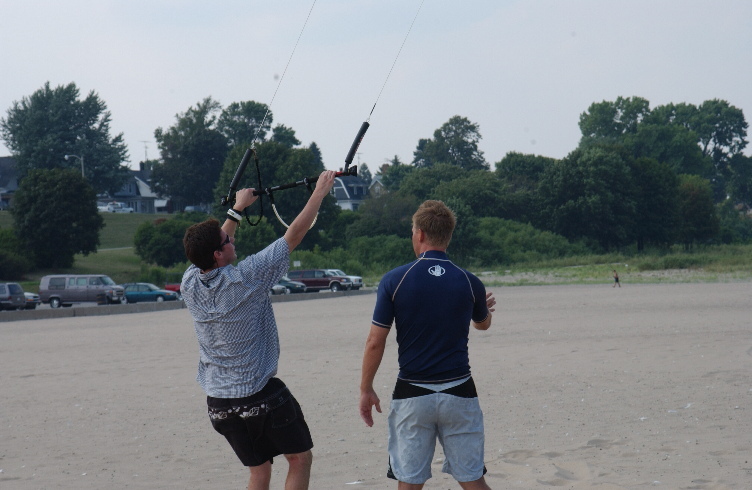 Advanced lessons are usually taught at the same location as the Introductory Kite and Control. This is a more personalized class and we are also available for quick Q&A sessions. Remember, we want students to learn to kitesurf, and to learn to be safe and stay within limits. We will not rush the training process! What you need for the class: You will need a personal wetsuit or drysuit, neoprene socks for your feet (optional) and anything to keep you warm out of the water (hat, gloves, blanket, towel, etc.). We will supply all the kitesurfing-specific equipment.